Cisco has designed a storage server that it claims is 56 per cent cheaper over three years than paying out for Amazon's S3 service. The networking giant also reckons it's the first fully modular server architecture in the industry. The S-Series is designed for data intensive workloads such as big data, streaming media and collaboration applications, and for deploying software-defined storage, object storage, and data protection solutions. Cisco says the boxes will try to access and analyze data quickly to generate results in real time, with unstructured data coming from sources such as the Internet of Things, video, mobility, and collaboration. Applications processing the data could be recommendation engines, video analytics, diagnostic imaging, streaming analytics, and machine learning. The concept is to analyze the data as close to its arrival as possible, and before it gets punted off to back-end storage. Its now a couple of years since the gen 4 C-Series range in Cisco's UCS server line was launched. The C3260 member of that range was positioned as a storage server, but what defined a storage server then has moved on. Now we've got the S-Series S3260, which is a follow-on from the C3260. 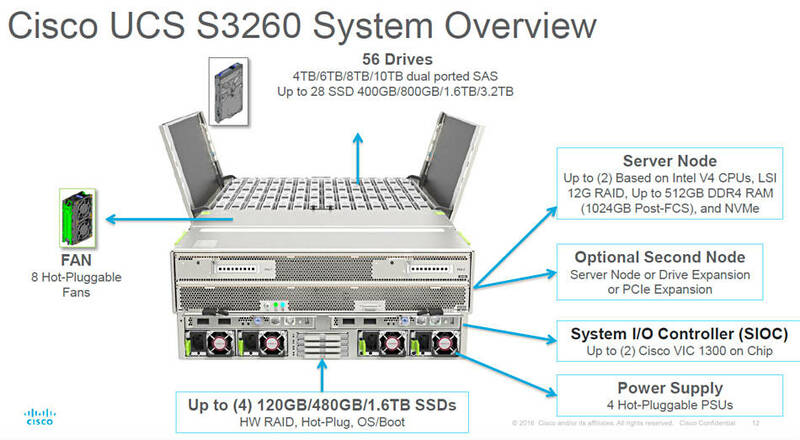 Much of the bare-bones specification remains, such as 600TB of local data storage with enterprise-class redundancy, connectivity including NFS, iSCSI, Fibre Channel (FC), FCoE, SMB and SMB Direct, scaling to petabytes with Cisco UCS Manager, and a dual-node two-socket architecture using Intel Xeon CPUs. But much else has changed, particularly the adoption of a modular design so that different components can be refreshed at different times. Dual two-socket server nodes using an Intel Xeon E5-2600 v2 or v4 CPU, with up to 36 cores per server node or 72 cores per system. This slide from Cisco summarizes the modularity. One point is that Cisco's 40Gbit/s virtual interface card (think VNIC) provides 256 virtual adapters per node plus 16Gbit/s native Fabre Channel options. Modular components include disk, SSD and NVMe media (caching flash with Fusion ioMemory3 PX), disk expanders, IO expanders, flash memory and Ethernet/FC/FCoE connectivity options. They can be cache-optimized, capacity-optimized, compute-intensive and IO-intensive configurations; the latter having 160GB/sec of aggregated VIC IO, and either 8 or 16Gbit/s FC. Capacity can be scaled out, by adding nodes, to 86PB in a UCS domain. Cisco also compared costs over three years with Amazon's S3 service: specially, 420TB of AWS capacity versus 600TB raw on the S3260. The comparable costs were, it is claimed, $0.015/GB/month for the S3260 and $0.041/GBN/month for S3. Cisco said all OPEX and CAPEX elements for the on-premises and public cloud scenarios were taken into account. Breakeven occurred at the 13-month point. Cisco's partner eco-system is being primed to take advantage of the S3260. Expect their offerings to endorse it shortly. For example, the S3260 can provide a hardware platform for Ceph, Cloudian, GlusterFS, Nexenta, Scality, StorMagic, SwiftStack, and Windows Server Storage Spaces storage software products. All these variants share a unified management facility. Cisco has an updated generation of its ONE Enterprise Cloud Suite, a hybrid cloud software offering automated deployment with a self-service portal tailorable for users, app developers and IT pros. Admin teams can deploy to over 20 different data centre, private and public cloud environments. There are annual subscription licenses with one, three, and five-year options at different price points.